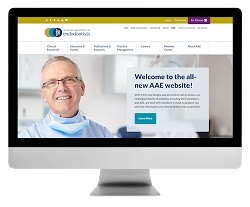 CHICAGO – The American Association of Endodontists is proud to announce our newly redesigned website’s Gold-level placement in the 2018 AVA Digital Awards. The new aae.org, which launched in December, won distinctions in the Redesign and Association sub-categories within the larger Web-Based Production | Website category. The AVA Digital Awards recognize outstanding achievement by creative professionals involved in the concept, direction, design and production of media that is part of the evolution of digital communication. The awards are sponsored and judged by the Association of Marketing and Communication Professionals, an international organization that consists of several thousand production, marketing, communication, advertising, public relations, and freelance professionals. AMCP administers recognition programs, provides judges and rewards outstanding achievement and service to the profession. Judges are industry professionals who look for companies and individuals whose talent exceeds a high standard of excellence and whose work serves as a benchmark for the industry. Crisp, clean designs liven up each page and make it easy for all visitors to find information quickly. Prominent buttons ensure efficient navigation through materials and resources to support all needs. The new site features a simplified, topic-based menu, with content reorganized for quick, intuitive searching. Its responsive design keeps the mobile-empowered user top of mind. The AVA Digital Awards program is an international competition that recognizes excellence by creative professionals responsible for the planning, concept, direction, design and production of digital communication. Judges are industry professionals who look for companies and individuals whose talent exceeds a high standard of excellence and whose work serves as a benchmark for the industry. Winners were selected from over 200 categories in Audio, Video and Web-based production. A list of winners can be found at avaawards.com.